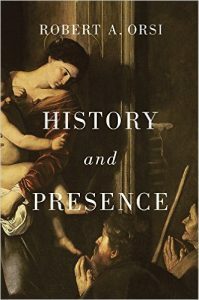 I have not read Robert Orsi's new book History and Presence yet, but something tells me that I should. It has something to do with "the gods really present." Hmmm... I'm thinking 1810. Tom Molineaux v. Tom Cribb. Until the book arrives, I enjoyed this interview with the author over at America. As you listen, notice how Professor Orsi navigates between the questions that he is asked, and the questions that he is likely asking in the book. Let me explain.... I have listened to this show before and the hosts are plenty intelligent and qualified to speak on all things Catholic. Put another way, they read the book and came prepared. But they are not caught up in scholarly conversations. Rather, they represent the perspective of your ordinary, intelligent Catholic. To his credit, Orsi responded by honoring their reading and interpretation of his work, and gently pulling the conversation back in his direction. Word on the playground is that Mike Pasquier will be reviewing this one. I look forward to seeing that, as I look forward to all of his work. Meanwhile, I found some good reviews here, here, and here. OK, I think that I need to be "really present" with my kids right now. They've been way too quiet for way too long.